Deputy: "The only thing I can consciously remember is seeing the gun shoot off at me"
A Montague County deputy who was shot by a wanted Colorado man says he only remembers bits of what can be seen in video from his dashboard camera. Evan Spencer Ebel, who was suspected in the slaying of Colorado's prisons chief and a pizza deliveryman, shot Deputy James Boyd three times at point-blank range during a traffic stop. Montague County Sheriff Paul Cunningham on Wednesday released dash-cam video of the March 21 shooting. 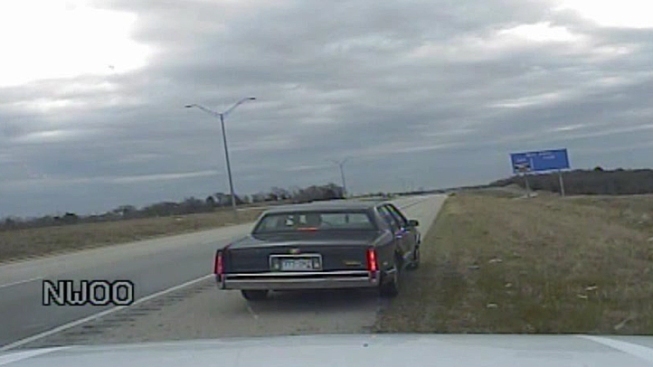 The video shows Boyd stopping the car for driving in the left-hand lane and not passing. As soon as Boyd approaches the car, Ebel can be seen quickly shooting Boyd three times -- twice in the chest and once in the head. He then speeds away. Deputy Injured in Shootout: It "Wasn't My Time to Go"
After a minute, drivers stop to help Boyd and call emergency crews. "I can remember stopping the car, making the approach, knowing something's not right," said Boyd, who has been recovering at a rehabilitation center in Dallas. "I can remember being shot, and that's about the point I blacked out for 30, 45 seconds," he said. "The only thing I can consciously remember is seeing the gun shoot off at me," he said. Boyd is scheduled to go back to work on Friday, nearly two months after the shooting. Even now, the video is still hard to watch, the sheriff said. "I mean, I don't know what else to say-- I was mad," Cunningham said. "That was somebody [who] hurt one of my deputies. You know, you want to strike back." "It's hard every time you watch it," he said, choking back tears. "You can almost feel the bullets when you're watching it." Ebel was killed later that day in a shootout in Wise County after the high-speed chase. Boyd said he's just grateful that his encounter with Ebel wasn't worse. "If it would've gone one way or another, I could be dead," he said. "It was a very close call. It just wasn't my time."